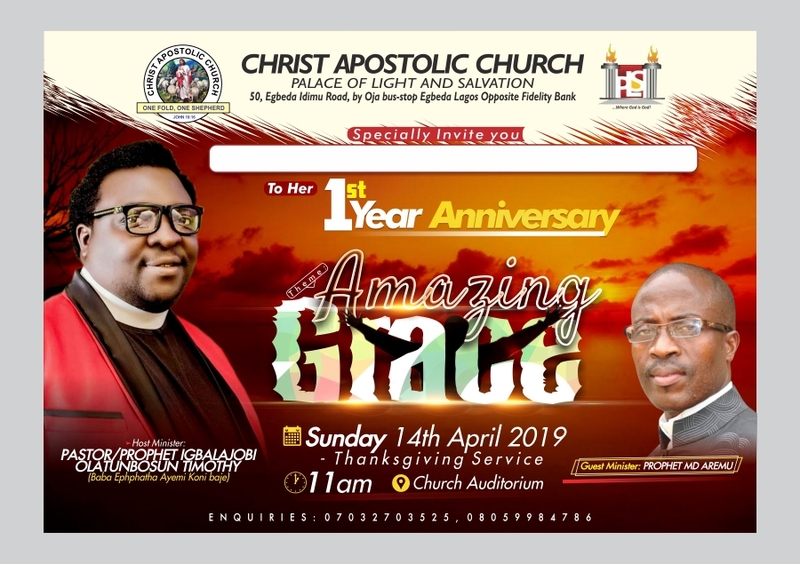 Christ Apostolic Church, Palace of Light and Salvation Assembly, Egbeda Lagos is set to hold her first anniversary. CAC News gathered that the anniversary will hold on Sunday April 14, 2019 by 11am. The theme for the celebration of one year of God's faithfulness is "Amazing Grace." Prophet M.D. Aremu is the guest minister of the programme which is expected to attract so many big personalities in and outside Christ Apostolic Church. CAC Palace of Light and Salvation is situated at 50, Egbeda Idimu Road, by Ojo Bus-Stop, Opposite Fidelity Bank, Egbeda Lagos.